Not wanting to sound the horn or anything, but: PEOPLE, THERE IS A GENERAL ELECTION COMING UP! Come May unless you adhere to Russell Brand’s non-voting strategy, then you could well be heading to the polling booth. We heard of ‘weaponising the NHS in the buildup and it looks like a weird old forthcoming election with the rise of UKIP and some pretty unsettling times here in the UK and indeed in the wider world. I put a picture of Farage on this post as I have heard time and time again people citing immigration as a key issue. I am very pro-European in essence. As a Translation student and a man with a passion for foreign languages, I embrace the ‘otherness’ of cultures from abroad. I think that in expelling immigrants and abandoning the European we would instantly be cats back into the stone age. 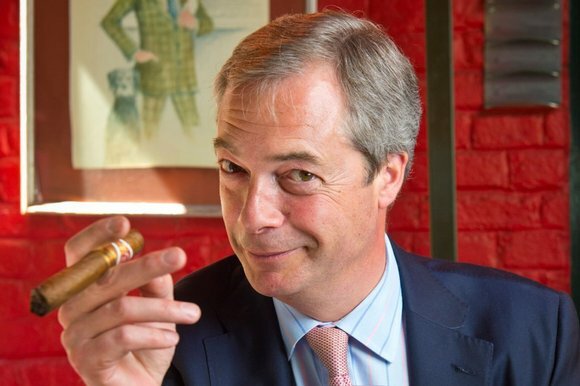 Immigration brings us a net benefit in terms of capital, cultural diversity and skills in the workplace, plus it would be rather difficult to study foreign languages in the education sector if all foreigners are thrown out à la Farage. But, politics aside, immigration is a real issue. We hear of how our NHS is full of nurses and doctors from abroad. In fact, I believe that I am correct in saying that proportionally, the NHS employs more foreign workers than the average organisation. I think that in healthcare, some of my pro-immigration views do distort. I can especially remember when my dying grandmother was in hospital. She came from a pre 1960s immigration boom generation. She was supporting an RAF pilot during WW2 and part of the incredible effort made by home soil women during that conflict. Her values and ideas were very old-fashioned and quite a bit different from my own. I felt a bit ashamed when she was openly cursing foreign NHS workers during her treatment. I found it a little rude, but, who am I to judge? I come from a more tolerant generation whose values have been shaped by a different set of problems and I live in a more or less totally globalised world. I wonder though, how the older, often politically silent generation feel about their healthcare needs being attended to by foreigners. We are constantly told how our education and especially higher education system is among the best in the world. If that is the case, why can not one of our biggest national establishments, the NHS, fill its parole with home-born, home-educated, British doctors and nurses? Are we lacking in the educational field for medicine? Are salaries in the NHS really that dire? We recruit from abroad in our healthcare sectors. Doctors and Nurses who have trained up and learnt their craft in a different educational environment, in nations where we do not control the political systems and where life values are very much different. I would argue that surgery is surgery and a surgeon, who is treating the body, usually of an unconscious patient, is either skilled and capable or not, wherever he has been taught medicine. He is not necessarily having to speak to a patient. He has no real need to understand them, and he has no real political power in terms of affecting that patient’s life, bar saving it from a scientific bodily perspective. At the other end of the top pay-scale NHS bracket, however, is consultant psychiatrists. They have no surgical function. They allegedly ‘treat’ mental issues, which are societal in nature and where the medical science is extremely lacking. My argument against psychiatrists, is that they have much more scope for errors in judgement. A psychiatrist who makes poor decisions can cover up their mistakes with political obfuscation. Their failures are buried in the system. They take people’s liberty, have the facility to treat against consent and their process takes on average a much longer period. They have more long term impact on a patient’s life and can be severely disruptive even if they happen to be benefitting the patient. A surgeon who makes an error on the operating table has little recourse for excuse-making as the patient will usually directly have a major emergency issue or the health problem (where science is a lot more accurate) will not dissipate. When you take into account the societal factors affecting mental illness and introduce immigrant psychiatrists to the equation we have a whole host of medical ethics issues. I can understand the internationalisation of academia, especially in today’s world. A medical degree in Prague, could carry equal weight as one from Delhi or London. Faculties exchange ideas, information and share resources. However, how can the value system of a a foreigner, born and brought up in a different land, be shaped as to fit the needs of patients in the host country? Over the 18 years I’ve been in the UK mental health system, I can actually count the number of UK born, UK raised, UK qualified psychiatrists who have treated me on one hand. There has been a rainbow of different nationalities involved in the senior position of psychiatrist in my healthcare, which on the whole has been very suppressive and done entirely against my consent, involving large quantities of restricted liberty. I’ve had consultant psychiatrists from Sri Lanka (Dr Nirmalie Mirando), Poland (Dr Agnieszca Tyson) and my current one is from Iraq (Dr Nahla Jamil). Other psychiatrists who have treated me hail from Sudan (Dr. Ali, Dr. Ahmed), India / Pakistan (unknown – several), Egypt (Dr Nimkar) other African doctors. There is a multitude of senior professionals who have had a lot of power invested in them by the British system. I question the ability of these doctors to be subjective and to truly understand British values and the psychiatry of people who are nurtured in this country. Most of them only arrived on these shores post- qualification, as young adults. They know little about core UK cultural values and textbooks I’m afraid are no substitute for living the real British life. I find these foreigners to be often lacking in critical understanding of what it is to be British. Often their medical knowledge of their subject field is vastly superior to the British psychiatrists that I have encountered. However, these doctors can be quite irrational and lack understanding. If you had been educated and brought up in a civil war environment, or behind the depths of the Iron Curtain, or in a land where Jihadism is rife and governments are notable for their lack of organisation, how can you hope to understand the complex nature of the United Kingdom and its remnants of Empire? Perhaps it is these very remnants which leads these doctors here to practise in the first place? I object to almost omnipotent unchecked power being awarded to foreign nationals, whatever their qualifications, as it leads to controversial issues which the almost childlike, trusting, naive nature of UK authorities cannot bring to heel. If these foreigners ever had malicious intent it would be far too easy for them to disrupt future generations of Britain through the suppressive nature of irresponsible legislation such as the Mental Health Act. In the USA, they have a sensible law that states that the US President has to be a US born US citizen. Does this make the USA a racist, undemocratic country? For or against foreigners in the NHS? I see the mental health branch of the NHS being an overall disgrace and believe that foreigners elevated to positions of power within it is a dangerous policy for senior NHS recruitment managers. I don’t believe in force and enjoy the ideology of democracy so I won’t force my ideas down your throat. It’s just an experience-based opinion and despite being on the whole pro-immigration, I feel that there should be rational balances and checks in place to protect the native-born nationals of these Isles. This entry was posted in Articles, Controversial, End Of Terror, Governments, Medical, Mental Health, Mental Health Act, Personal Mental Health Experience, Politics, Psychiatrists, Psychiatry and tagged agnieszca tyson, Delhi, Dr Ahmed, Dr Ali, Dr Jamil, Dr Mirando, Dr Nimkar, Dr Tyson, Egypt, immigrant doctors, immigrant doctors on the NHS, immigration, London, Mental health, mental illness, nahla jamil, NHS, Nigel Farage, nirmalie mirando, nurses, Poland, Prague, Psychiatry, Sri Lanka, Sudan, WW2 on 15th January 2015 by Wez G.